Jason Juno/Daily Globe Ewen-Trout Creek's Eli Nordine shoots during Monday night's game at Ontonagon. He scored 23 points off seven 3s for the Panthers. ONTONAGON — It took Ewen-Trout Creek just over four minutes to undo Ontonagon’s superb first half. The Panthers scored the first 15 points of the second half to erase a 14-point halftime deficit, and they went on to win 62-47 in Monday night’s exciting season opener. The Gladiators led by as many as 19 points, 35-16, in the first half, riding the hot 3-point shooting of Mitchell Borseth. But E-TC cut the lead to a more manageable 14 at the half and thrived on the chaos its full-court man defense created to take a 38-37 lead with 3:48 left in the third quarter. The pressure created six Ontonagon turnovers in that time and the Gladiators weren’t even able to attempt a 3-pointer in the third quarter. E-TC turned to a full-court man it hadn’t even practiced this fall yet to win in its first game of the season. Jake Witt and Eli Nordine led E-TC with 23 points each as Nordine hit seven 3s, and Witt had 16 points in the second half. “It was good for us to be down that much at halftime, come back on their floor and get the win,” Witt said. The Gladiators were happy with their first-half effort, but they wanted to close it out against their archrivals. 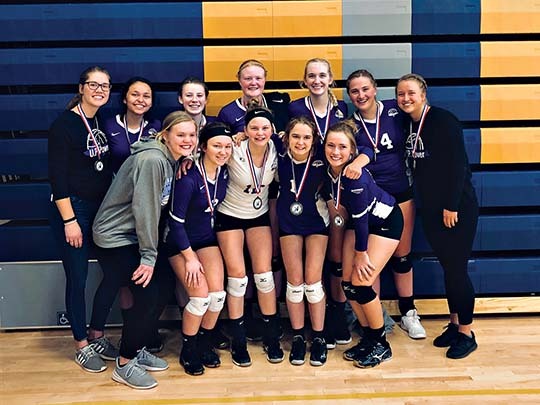 “It was a tough loss, we always want to beat Ewen, but they have a special kid in Witt,” said Ontonagon coach Andy Borseth, who had quite a first game as a varsity coach. Even though Mitchell Borseth dropped three 3s in the first quarter, E-TC escaped the frame down by just two points, 13-11. But he came out hot again in the second quarter, scoring the first 14 Ontonagon points of the second quarter. That gave the Glads a 27-16 advantage. Jaden Weisinger followed with a pair of treys of his own to make it 33-16. A transition layup by Dustin Howard had the Panthers on their heels, trailing 35-16. The Panthers closed out the half on a positive note, outscoring the Gladiators 7-2 and going into the half down 37-23. 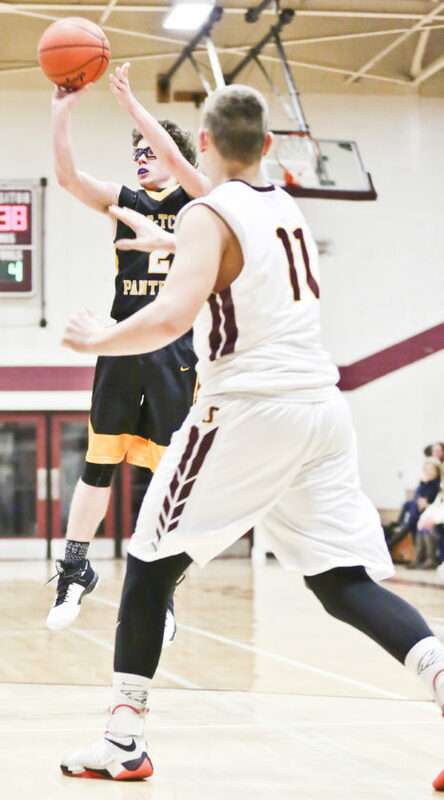 After Witt didn’t get many first-half opportunities at the rim, he made E-TC’s first two buckets there, between a 10-second violation by Ontonagon, an early hint of what was to come. The hectic pace helped free him up also. Nordine hit two 3-pointers to bring it down to 37-33 with an Ontonagon travel preceding both of them. After the Gladiators were called for a double dribble, Austin Berglund stole it, got the transition layup and made it a three-point play with the made free throw. Ontonagon’s lead was down to 37-36. Ontonagon missed a layup and E-TC got a transition opportunity out of it as Witt made a layup to put E-TC ahead 38-37 with 3:48 left in the third. “We were down 14 and we knew we had to come out strong, play some good man, play some good defense that creates the offense,” Nordine said. The Gladiators stopped the bleeding long enough to enter the fourth quarter tied at 42-42. They even led a couple of times early in the quarter. A mid-range jumper by Borseth gave Ontonagon a 46-45 lead early in the fourth, but E-TC scored the next 10 points to take a commanding 55-46 lead. Witt got a putback to go to give E-TC the 47-46 lead with 5:31 left. Berglund was on the receiving end of an offensive foul called on Borseth and Nordine followed with his only 2 of the game to give E-TC a 49-46 lead. After a free throw, Ontonagon committed a back-court violation and Witt scored in the paint for a six-point lead. Nordine’s seventh and final 3 gave E-TC the nine-point cushion. “Jake’s jumper in the paint was big,” Besonen said. Ontonagon wasn’t surprised how E-TC came out in the second half, but it couldn’t handle it effectively. “Not only the guards, but the entire team succumbed to the heavy pressure,” Borseth said. Nordine was 4 of 6 from behind the arc in the second half. Witt was 6 of 7 from the floor after halftime. His shot seemed well off in the first half, but he actually shot 50 percent, 4 of 8. “We were focused on Jake,” Borseth said. “In the same sense, we said, ‘You have to recognize, when Nordine’s in the corner, you have to know it’s him.’ We lost sight of him being in the corner. Any other guy, we were fine with, but we knew Nordine could knock that shot down. He’s a nice shooter. Jake’s just a beast. Borseth finished with 29 for Ontonagon and Weisinger had 10. Borseth was 7 of 8 from 3 in the first half. Making it a full-court game helped take the Gladiators’ outside shooting out of it. E-TC (1-0, 1-0) hosts Hancock Thursday. Ontonagon (0-1, 0-1) hosts Republic-Michigamme Thursday. E-TC — Eli Nordine 23, Ryan Driesenga 7, Austin Berglund 9, Jake Witt 23. FTs: 12-20. Fouls: 11. Fouled out: None. 3-pointers: Nordine 7, Witt 1. Ontonagon — Jaden Weisinger 10, Mitchell Borseth 29, Dustin Howard 4, Tanner Balcomb 4. FTs: 6-12. Fouls: 22. Fouled out: Weisinger. 3-pointers: Borseth 7, Weisinger 2.